“…speaking words of wisdom, let it beeee. Words of wisdom indeed. I dragged my friend Abby into the hive this past weekend. 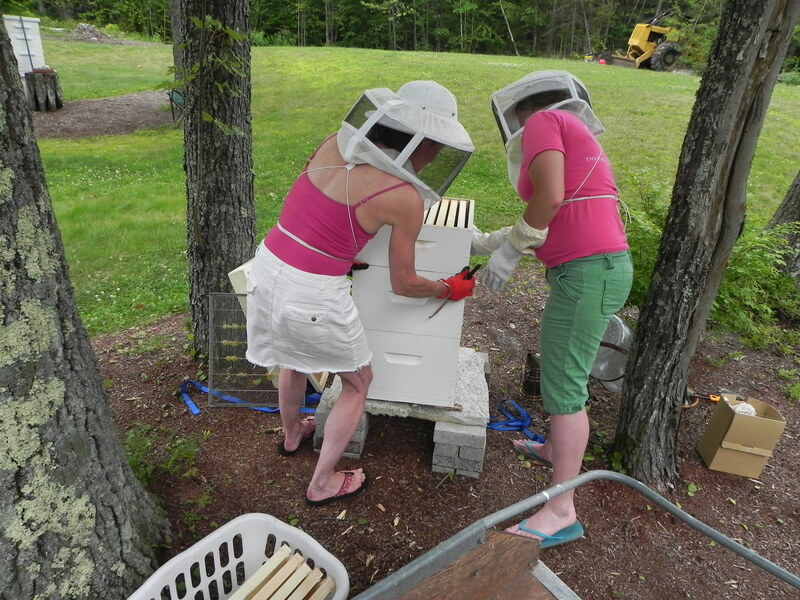 It is really and truly a coincidence that my last post featured my same bee keeping attire. The fact that Abby showed up in pink too, was serendipitous. In truth, I didn’t have to drag her at all. 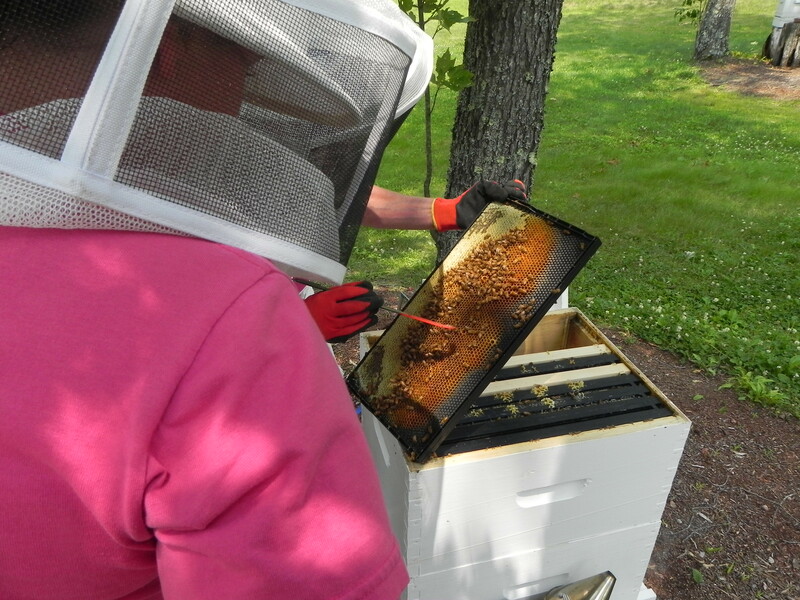 Though she had the normal trepidation any sane human would exhibit when faced with tens of thousands of insects that sting, she bravely suited up with me and manned the smoker. This was a total inspection on my original hive including removing the queen excluder from between the top two boxes and trying to find signs of a queen all the way to the bottom. This hive had swarm cells last week and though I removed them, my morning mug of tea with the ladies all week made me think something was amiss. They didn’t seem to be flying as much as the second,healthy hive. They just seemed listless and agitated, hanging around the landing board like a girl scout troop without a leader. We found nothing, no brood, no sign of a queen for a long time. What brood had been there when she left, had since hatched, adding to the civilization of confused beings. They were docile and resigned. With heavy hearts we respectfully returned the boxes and closed the lid to return them to their sorrow. I went inside and emailed my bee mentor, Jodi, with the sad news and pleas for something I could do, some way to instantly restore their universe to its former grandeur and peace. “Give her another week. Sometimes it can take 2-3 weeks before you see eggs. Hard as it is we need to try to be patient. If you don’t see eggs by next Wednesday (1-1/2 weeks) then I’d do a proper combine, but not quite yet. This entry was posted in memoir. Tagged bee keeping, Let It Bee by The Beatles, loss of a queen, New Hampshire, words of wisdom. So does “give it a week” mean that the queen is having a mid-life crisis and will come back or that there is a new queen somewhere in the hive? Confused. Sorry for the confusion Chris. Jodi seems to think she is there, probably just immature so I didn’t recognize her. That would be my third new queen of the season. Hope a new queen emerges soon and the hive will get back to normal. Let it be is sometimes all you can do. Me too Laura. I hate to see them so depressed, or whatever bees feel. Waiting is so hard. Hope she emerges soon and her subjects can rejoice. You above all, appreciate the hard life of the RC of the Realm, Phil. Thanks. Bees sure make beautiful patterns, don’t they? The shape of the honey comb, completely derived from a civilization smarter than ours, is perfection. Thank you for reading my little thoughts. It must be tough trying to figure out what bees are doing and why. I wouldn’t even know where to start. Thank you! So glad you enjoyed my ramblings! I hope there is a queen in there. I’m holding my breath! Thanks Marie. I am checking them from afar every chance I get…feeling like a mother hen but hoping for the best.